Congratulations ! The original artwork is available for purchase for $1348.60 shipping included. You will be able to review this purchase in the subsequent screens. If you have a question, please email support@pastelspace.com. Purchase 2042 x 1500 pixel digital file by using the Buy Now buttons below. You will receive an email with the download link. You can use the link 5 times to download the digital file. Ideal option for reproducing 'pastel on paper' and 'watercolor on paper' paintings and for very high end reproduction of digital photographs. Choose a size and see how it will look under the selected size before ordering a print. Also choose crop and border. As an example, if you select an 8"x10" archival print with 1" external border, you will receive a 8"x10" print on a 10"x12" piece of paper. Ideal option for reproducing digital photographs in a cost effective way. Choose a size and see how it will look under the selected size before ordering a print. Also choose texture, crop and border options. As an example, if you select an 8"x10" page size and 0.25" internal border, you will receive an 8"x10" piece of paper with a 7.5"x9.5" print inside. Ideal option for reproducing 'oil on canvas', 'acrylic on canvas' and 'watercolor on canvas' paintings. Choose a size and crop options and see how it will look under the selected size before ordering a print. Canvas giclee prints are produced with 3" of additional canvas on all sides so that you can stretch and frame your print on your own. As an example, if you select an 8"x10" canvas print, you will receive a 8"x10" print on a 14"x16" piece of canvas. 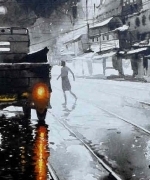 Arpan Bhowmik has the gift of breathing life into his cityscapes, especially the ones with a night setting against the backdrop of the monsoons, which makes the black & white palette come alive. 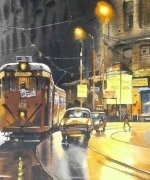 The shining lights & the reflection of the legendary yellow cab in the puddles all highlight the glory of the heritage city & the skill of the artist in this remarkable composition..
New artwork uploaded. 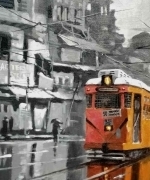 Arpan Bhowmik has the gift of breathing life into his cityscapes, especially the ones with a night setting against the backdrop of the monsoons, which makes the black & white palette come alive. 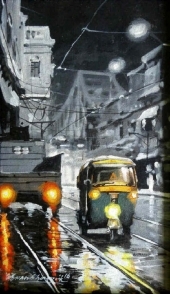 The shining lights & the reflection of the legendary yellow cab in the puddles all highlight the glory of the heritage city & the skill of the artist in this remarkable composition. 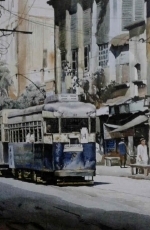 Accomplished Artist Arpan Bhowmik from Bengal has the gift of recreating a cityscape in great detail, with the source of light or rain, as the case may be, beautifully delineated in the structures, objects & people in the composition. 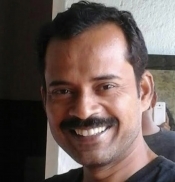 He has won many awards and is a versatile artist. 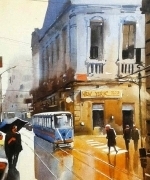 Although his medium is acrylic on canvas, he creates the illusion and transparency of watercolours. His forte is to use a monochromatic colour palette to resemble a black & white photograph, with the introduction of a dash of colour as a dramatic element which is both arresting and attractive, especially in the larger sizes of canvas.